The autumniest month choo-choos into high gear, in Felton. he autumniest month choo-choos into high gear at the Harvest Faire & Steam Festival in Felton. SATURDAY, OCT. 3 AND SUNDAY, OCT. 4: We've got just three words for you, plus an ampersand, and here they are: "Make & Take Scarecrows." Right? This is what you daydream about back in the sunny days of summer. There shall also be a pumpkin patch, gold panning, the making of candles -- perfect ahead of those long winter nights ahead -- and other cozy/comfy/homespun happenings that put the zest in a classic harvest fest. 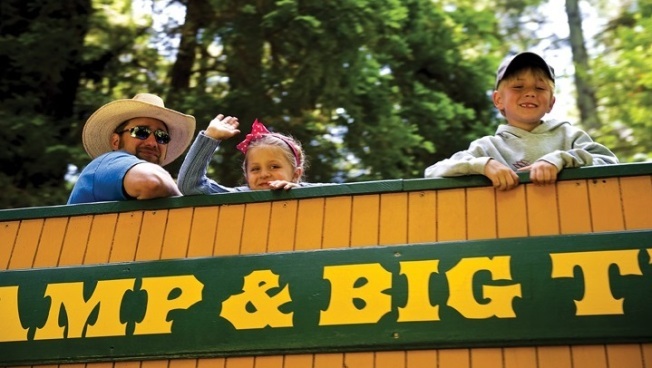 You can buy a ticket and hop on a steamtrain, to commune with the redwoods, as one should do whenever one has the opportunity, or you can stick close to the festival to soak in the autumnal-meets-ye-olde doings. This is more harvest-y than Halloween, do note, if you're hoping for a costume-and-candy thing, though a Halloween feel shall be in the air. But don't harvest time and Halloween make rather swell neighbors? Being all snug together and sharing the month, as they do? And shouldn't the first weekend of October always be saved for those October aficionados who can't wait another minute to get their autumn on? "Yes" and "yes" are the correct answers, in case you're wondering.